Motorola makes a 25W GMRS radio called the SportBase which would appear to be an SM50. We have been told that it should be able to be programmed if you use version R04.00.00 or newer RSS. Program these radios with this cable. Take a look at the accessory connector. In the SM50.MDF file make a Checksum-16 of the whole file (the F12 option in Hex Workshop), in our case we ended up with 0xAC94 (RSS V 02.00), write this down, you might need it later. The highlighted area contains all the possible bandsplits that this particular RSS will recognize. Note there are 3 occurances of the strings 50 05 and 18 06, the first set is the limits displayed in the Radio Wide menu (F4-F2). The second set are the TX limits for the radio. The third set are the RX limits for the radio (note that if the TX and RX limits are not set the same the RX limits are screwed up). If you are using a calculator enter your limit (ie 1620 for 162.000 MHz) and convert it to hex, you should get 0x0654. 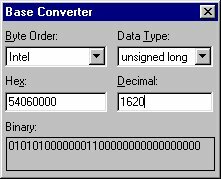 When you enter the data into the .mdf file you have to reverse the bits such that you would actually enter 0x5406 in the field you are changing. You can then directly enter the hex result (0x5406) into the bandsplit field. In this example we are changing the upper bandsplit of a 136-156MHz radio to 136-162MHz. We have not tested this and have no idea whether it will work or not, it is just a theory, someone email us if you try it and it works! It is our theory that the 10 channel radios probably have the same firmware as the 16 channel radios and are just programmed different. If you want to attempt and convert your 10 channel radio to 16 channels, follow these steps. Open the SM50.MDF file in your Hex editor and make a Checksum-16 of the entire file (the F12 option in Hex Workshop), in our case we ended up with 0xAC94 (RSS V 02.00), write this down, you might need it later. If you look at this model entry, the third byte after the model number (offset 0x613) is a 0x0A. This is the hex representation for the number of channels in the radio, in this case 10 ch. Change this to 0x10, to give you 16 channels. Also note the 0x01 at offset 0x611, this is the bandsplit identifier for this radio and corresponds to the table entry at the top of the .mdf file. 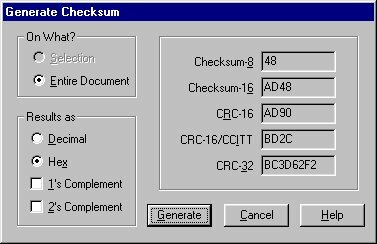 Once the checksum's of the files match you should be able to run the RSS, load the codeplug, and add and program the extra channels. One thing you have to be careful of is that the RSS will let you put as many channels into it that you want, what the radio will accept is another thing. It appears that once you exceed the maximum number of channels for a radio and try to program them in, the firmware will "wrap" the extra data around to the beginning and start programming from channel 01. You will be able to tell if you have exceeded the maximum number of channels by trying to program in one channel at a time until it "wraps", ie. if the maximum number of channels your radio will take is 16 and you try to program 17 channels into it, once programming has finished you will find your radio will only show 1 channel. Another thing that might happen is that if you exceed the number of channels programmed into the radio, the display will show funny things as you scroll through the channels, it depends on the firmware in the radio. Well, we ordered the service manual (part number 6880903Z45) to see how hard it would be to convert the SM50 into a SM120 in order to add more channels. After some research, it looks like it might be possible by changing the control head. However, the price of the SM120 control head is worth almost as much as the whole radio. So, for now, this project is on hold. Below is the chart that should decode SM50/SM120 models, if there are any errors, please let us know. As you can see, the example given M34DGC20C2A_ would correspond to a 10-25W, 450-470MHZ, 16 Channel SM120 with 20/25kHz channel spacing.